DML has now followed up its “Desert Raider” version of the Willys MB Jeep with another conversion favorite, the “armored” version seen late in WWII. This kit now comes with the floor-mounted pedestal for a machine gun (here the M2HB or “Ma Deuce”) and a set of thin armor plates for the grille and that wrap around the driver’s and commander’s seats. 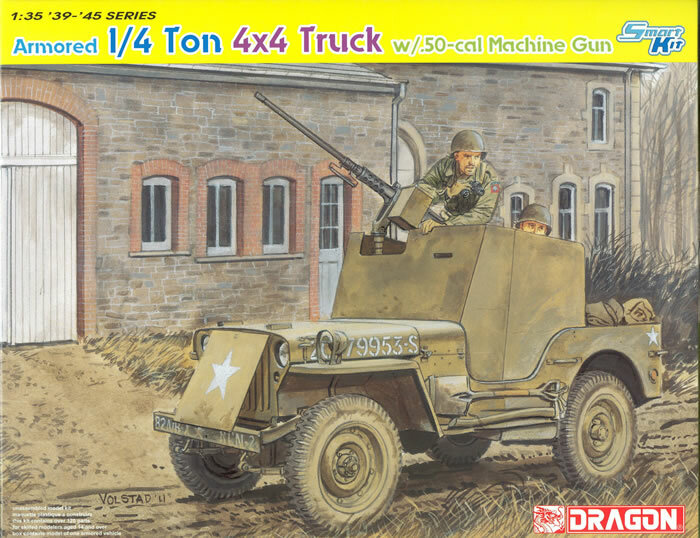 As with previous kits by companies other than Tamiya, since Chrysler Corporation demanded royalties for using the name “Jeep” this kit, like the previous one, does not state what it IS but just sort of what it DOES. This kit exchanges a number of sprues from the first kit for ones that more accurately represent the US model of the vehicle as a standard model. It comes with the back seat, top bows, and more of the details visible on the normal vehicle; all of the kit provided with the LRDG variant is gone. The body is slide molded with all but the rear plate in one go. There are some serious injection pin marks on the bottom of the body and under the fenders, but other than the fender wells I don’t think most modelers will bother with removing them. The drive line is typical of modern kits, axles with differentials and a separate differential cover, separate shock absorbers, steering links and a tie rod. The transfer case comes with the front drive shaft in place but the rear one is a separate part. The wheels are conventional front half with all tread/rear insert type (staggered tread pattern) and separate brake drums. Springs are the usual type, but the skid plate comes with the muffler attached (part B41) which is new to me for an assembly. Note that hard-core Jeep fans noted the wheels on the first kit were not correct and had the wrong shapes to the dish portion; this one appears more accurate but I leave it to the fans to sort it out. Also it comes with a new grille, and the fans also noted the first “cutaway” one had the blackout lights in the wrong place. This one appears better but again I leave it to the faithful. All seats have separate pads and backs, and the controls are very complete, to include pedals. The vehicle’s armament consists of a .50 caliber M2HB model; for some reason TWO are provided in the kit with one having much more detail than the other. This seems odd as one is a new mold for this kit in specific whereas the other comes from DML’s late model M4 tank kits. with the aviation sleeve on the barrel. Both are slide molded with hollow bores and come with ammo boxes but only one per gun. A pedestal mount with braces is included for use with either gun. The etched brass for this kit appears to have gotten fouled up at some point, for the diagram and the fret do not match. The fret includes two MA2 parts and part MA10 is provided separately on a tiny fret. But this is to no avail as neither one is called out in the directions! Somebody at DML needs to QC this and sort it out. One painting and marking option is offered: US Army, Western Front, 1945 (OD with white stars and USA W20495533-S registration number). A “number jungle” sheet of Cartograf decals is provided for the latter. Overall this is not a bad kit, but the disconnects in the directions do not help with assembly. It is also a very expensive kit at $12 more than the excellent Tamiya one (which paid the money for royalties and apparently received factory assistance for their efforts).